One very useful Coveo access point is the built-in search box of your browser. 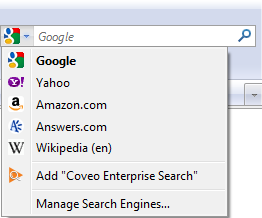 You can easily add Coveo to the list of search engines available in the built-in search box of your browser. Important: Your Coveo administrator must publish an OpenSearch provider for your Coveo search interface before you can see and add the Coveo search engine in the browser built-in search box (see Publishing an OpenSearch Provider for a Coveo .NET Search Interface). 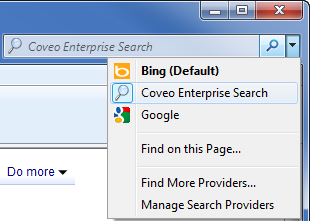 Using Microsoft Internet Explorer, Mozilla Firefox, or Google Chrome, access the Coveo search interface that you want to add to the built-in search box of the browser. Note: Internet Explorer 9+ by default only supports predefined search providers so you cannot add your Coveo instance as a search provider from the IE 9+ user interface. The www.enhanceie.com website however proposes a solution. In the drop-down box next to the search box, click Add Search Providers, and then select the item corresponding to your Coveo implementation. Note: The name of your Coveo implementation is specified by your Coveo administrator and may therefore differ from the one shown in the following figure. Note: If the name of your Coveo search engine does not appear in the menu, ensure that your Coveo search interface is opened in the browser and verify with your Coveo administrator that he has published an OpenSearch provider for the Coveo search interface. In the Add Search Provider dialog box, click Add. With Mozilla Firefox (illustrated with version 13), in the drop-down box next to the search box, click Add "[Your_Coveo_Implementation]". 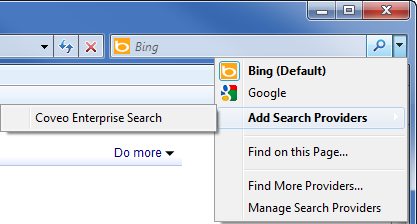 Right-click in the omnibox (combined address and search box), and then select Edit search engines. In the first box, enter the name that identifies your Coveo search interface. In the second box, enter www.Coveo.com or another keyword of your choice. Click somewhere in the page. The entered information becomes one element of the Other search engines section. On the line corresponding to the newly created search engine, click Make default. The selection moves from the Other search engines list to the Default search settings list, and it is now the default search engine. 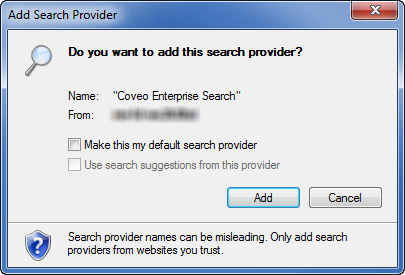 Ensure that you added your Coveo search engine as a search provider in your browser (see Adding Coveo to a browser built-in search box). 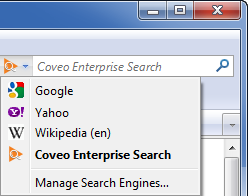 In the drop-down box next to the search box, click the item corresponding to your Coveo search engine. In the built-in search box, type keywords and then press Enter, or click the search icon. Your Coveo search interface appears with the corresponding results. 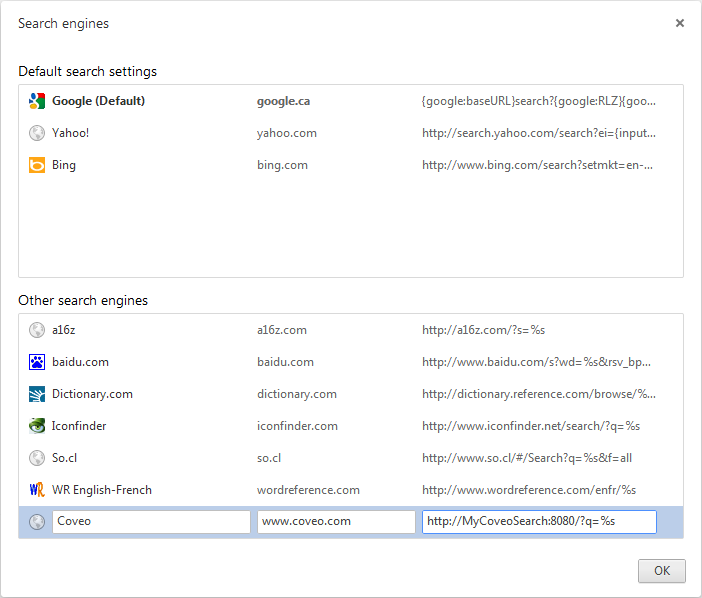 In the Search engines page, in the Default search settings list, when your Coveo search engine is not the default one, on the corresponding line, click Make default. In the omnibox, type keywords and then press Enter, or click the search icon.